According to ARM, workers tormented and beat cows on a daily basis using PVC piping and homemade "shafts," which include a kitchen knife attached to the end of a pipe. The video also shows workers using blow torches to burn the cows. ARM says the torches burned the hairs off the cows' udders to sanitize the teats before milking. WARNING: Footage may be disturbing to some viewers. Animal Rescue Mission released undercover footage of cows being burned that they say was taken at McArthur Dairy Farm in Okeechobee this year. "Animals are being beaten with makeshift spears, with razor sharp pieces of PVC, are being stabbed in the face and the private areas," ARM founder Richard Couto said at a news conference Thursday. Southeast Milk, a dairy cooperative that ships and markets milk from dairy farms, released a lengthy statement Thursday in response to the video. "As we’ve said, we take these allegations extremely seriously. We have zero tolerance for animal abuse and will make any improvements needed to ensure the health and well-being of all dairy cows. Southeast Milk, Inc. (SMI) continues to take corrective action including holding mandatory management and animal care trainings for all SMI member owners this week," Southeast Milk CEO Jim Sleper said in the statement. "We are working closely with our members to install or improve video surveillance on their dairies and have accelerated the adoption of the newest iteration of the National Dairy F.A.R.M. Program, which requires even more employee training on farms and stricter requirements for working with veterinarians, among other standards. These actions reaffirm our commitment to our customers and consumers that animal care is our top priority. Authorities in Okeechobee County said three McArthur Farm employees have been arrested and a warrant is out for a fourth. They could face felony or misdemeanor charges for animal cruelty. ARM has released similar undercover videos from other Florida dairy farms in recent months that have shown workers kicking and prodding cows. 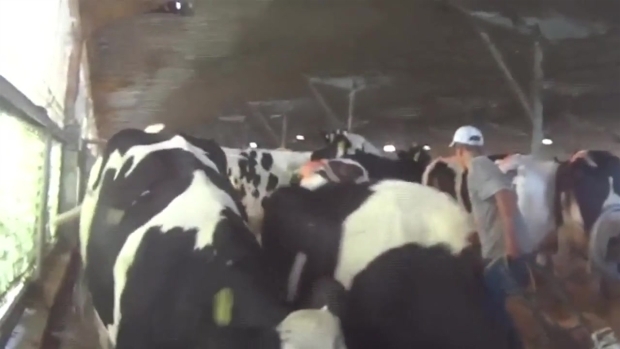 On Wednesday, ARM released video of alleged abuse at Larson Dairy farm, and claimed the farm's owner knew of the abuse. Another video showed alleged abuse at Burnham Dairy Farm. 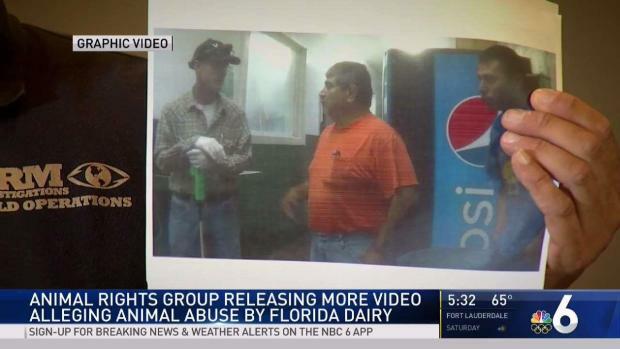 A animal rights group released new video Wednesday of alleged abuse at a Florida dairy farm and is claiming that the owner of the business knew about and participated in the abuse. The footage was released by Animal Recovery Mission founder Richard Couto at a news conference in Deerfield Beach.